As many of you will be aware, I’ve recently returned from operating as VP9/M0BLF in Bermuda. Overall, it was a great trip but it was marred on a few occasions by some discourteous and unruly operation by a small proportion of the DXing community. A lot has already been written about pile-up behaviour but I thought I’d add my two cents from the point-of-view of the DX station. As I considered the topic, however, I realised this is basically about following some simple rules. At the risk of this sounding like a bit of a rant, therefore, here are my thoughts. First, though, I should note that a lot of this post is focused on CW operating. That’s because my CW is weaker than my SSB, and so the problems become magnified. Generally, however, the rules are the same for any mode. I should also note that this post isn’t an excuse for my (at times) poor CW operation. It’s something I need to practice. But you, the pile-up, could make my life a lot easier while I improve my skills. I don’t care whether I’m DX for you or not, or whether you need the QSO for DXCC or another award programme. If you can’t hear me, we won’t be able to have a contact. It’s that simple. Generally, I’ll be operating split, so you should be able to hear me on my calling frequency. If policemen are getting in the way such that you won’t hear me replying, don’t call me. If there’s deep QSB, listen and learn the time between the peak and the trough, and call me around the peak only. You really slow my ability to work the whole pile-up if you call when you can’t hear me. This should be obvious, but a few too many callers had to resend their callsign because they put the wrong letters in it. Similarly, and this mainly applies to people using straight keys, check you can send your callsign reliably a few times without corrupting it, maintaining the right rhythm and a 3:1 dash:dot length ratio. If you can’t do this basic thing, don’t call me. If you’re new to CW, consider programming your callsign – once – into a CW keyer memory. I’d rather have computer/keyer-generated perfectly-sent CW than errors. Also, I’d prefer you only to send your callsign once unless I ask for you by a part of your callsign, but I know that’s not always going to happen. If you do repeat your callsign, make sure the gap is clear with a suitable break. If I hear ‘M0BLFM0BLF’, that’s likely to confuse me, particularly if I only hear part of it. Only after you’re certain you can hear me and you can send your callsign should you actually call me. Always send at my speed. I was doing 20wpm in VP9. I can receive well-sent Morse at up to around 23wpm reliably. This means that if you transmit at 35wpm, you’ll have to repeat yourself several times, which will frustrate both of us. If I ask for you to call me by a partial callsign, everyone except the person with that partial should stop calling. If you have a callsign that’s similar to what I’ve asked for, give it a few seconds (to allow anyone with the exact match to reply first) and then call me once. Above all, make sure you know whom I’ve gone back to: two people won’t be getting VP9 confirmations because I went back to someone different. If I ask you to repeat your call several times, don’t be condescending by slowing down or, worse, making dashes longer. It’s probably just someone calling on top of you but changing your speed makes me have to concentrate more, not less. Unless it’s fairly quiet, I want to give as many people as possible the opportunity to call me, so I only want to hear your callsign and my report. If I’m happy to have a chat, I’ll indicate this by telling you my name and making some trivial remark like something about the weather. Let me, as the DX station, guide you on this. If you haven’t had that cue from me, please do not ask me anything else, or give me other information. I’m highly unlikely to ask your name, let alone log it. Additional information can also be actively confusing. For example, a lot of US stations have the habit of giving their US state abbreviation after the RST report. I don’t need to know this and, if it is similar to your callsign, it could lead me to correct something unnecessarily. (If you call me as W0ABC and then send me state code AB twice, I may well ‘correct’ your callsign to W0AB). Above all, don’t ask for QSL information. It’s widely published, and it’s probably quicker for you to look at QRZ.com or similar. And don’t ask for my ‘callsign again slowly’, especially if I’m mid-pileup. It will be on the cluster and/or RBN, and I’ll be saying it at least every 3 QSOs too. As far as I’m concerned, if you haven’t got my callsign, that’s your problem, not mine, and you should know it before you call me (don’t trust what the cluster says, either). In a smaller pileup, only the first reason above applies. In these cases, I’ll generally be saying ‘UP1’ on CW (for a 1kHz split) or ‘Up Five’ on SSB (for a 5kHz split). If you hear this, use that split only. If you go up 4kHz when I’ve said ‘Up Five’, I’m unlikely to ever find you. On CW, however, you should add or subtract a slight offset of up to 200Hz so you don’t all end up with exactly the same beat frequency. This is particularly important if you’ve just clicked on a DX Cluster spot with a QSX frequency set in it. If you don’t move at all, you will have exactly the same note as everyone else and I won’t be able to distinguish any of you. It’s amazing how many people don’t seem to realise this. In a larger pileup, both of the reasons above apply. In these cases, I’ll generally be saying ‘UP’ on CW (which you should interpret as being about a 1kHz – 2.5kHz range) and ‘Up Five to Eight’ on SSB (a 5kHz-8kHz range). In this scenario, I really want you to spread out. Don’t all congregate on round-number frequencies and, again, if you have clicked a spot with a QSX frequency, you almost certainly want to change your split from the one in the spot so you stand out. I’ll typically be operating according to a pattern in this scenario. For example, I might start at the top of the range, make a couple QSOs, then drop down until I find the next person and make a couple QSOs there, and then move down a bit more. The most efficient operators will be constantly trying to find where I’m listening, so they can predict where in the range I’ll be listening next. Once we’ve had our QSO, please move off the frequency and ensure you clear your split. Again, a few too many times in VP9 I was called about five minutes after a previous QSO by the same station, and I’m pretty certain this was actually them calling someone else but leaving their split in. 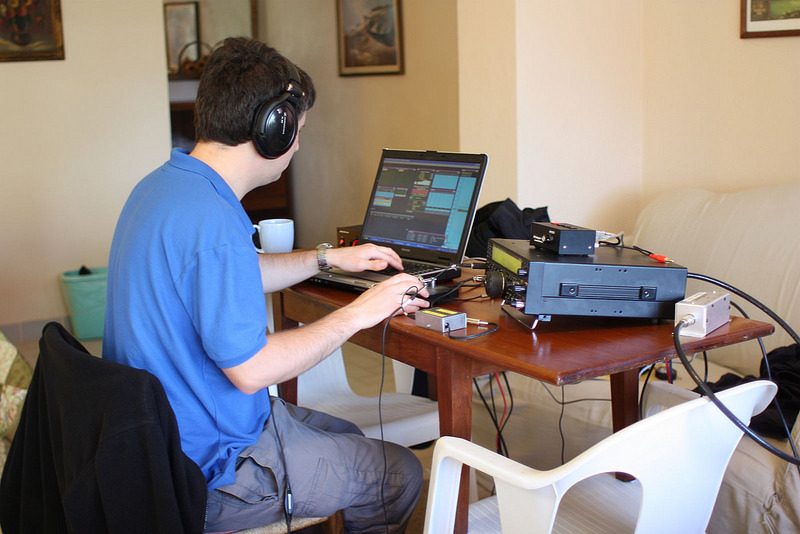 Depending on the availability of internet access at the DX location, I may well regularly be uploading my log to LoTW and/or Clublog during the DXpedition. If so, use these tools to check you are in the log before calling me again on the same slot. There is no excuse for dupes when my logs are available.